It is William Becker and Bethe Hagens who ultimately solved the puzzle for us. At the time their work was published, Dr. Becker was a Professor of Industrial Design at the University of Illinois, Chicago, and Dr. Hagens was a Professor of Anthropology at Governors State University. Together, they demonstrated how these two shapes were first discovered, and then how they assimilated into the ultimate Earth Grid, which they called the Unified Vector Geometry 120 Polyhedron, or the UVG 120 "Earth Star." Although we had said before that the modern history of the Global Grid may start with Bruce Cathie, the former husband-and-wife team of Becker and Hagens have a different idea. They ascribe this discovery to the work of Ivan P. Sanderson, who was the first to make a case for the structure of the icosahedron at work in the Earth. He did this by locating what he referred to as "vile vortices," or areas of the Earth where mysterious disappearances, mechanical failures and time-space distortions were seen to occur. Obviously, most readers are aware that the Bermuda Triangle reports from the east coast of Florida would fall into this category, but Sanderson looked at other, less popular areas as well. These areas were often referred to as "Devil’s Graveyards," since many explorers simply disappeared if they crossed over them at the wrong time of year, apparently with the wrong lunar and planetary alignments activating that particular area. What initially led Sanderson to this work is the case of, as Charles Hapgood referred to them, The Maps of the Ancient Sea Kings. We now know that during the time of Atlantis and perhaps much earlier, the entire Earth’s coordinates had been mapped out by the construction of the different pyramids, temples and earthworks on the Earth’s surface. Carl Munck demonstrates this beyond all possible doubt. Therefore, it is almost inevitably obvious that there must have been many Atlantean maps of the world at one time. These maps would have been very precise, given the level of sophistication that we have seen in the precise execution of Munck’s worldwide "Code" of coordinates. We can speculate on how these maps might have been handed down, based on a variety of sources of information. We are told that after the last pole shift 12,500 years ago, the main body of Atlantean land sank. The survivors from the Atlantean priesthood kept themselves in a tight-knit, secluded monastic community, since most of the rest of humanity had descended into barbarism. Since most of the land disappeared, with only a few survivors left, it is clear that only a select few of these maps remained as well. The Sumerian civilization may have been the Atlanteans’ first attempt to rebuild society to any significant degree, and this was started circa 6,000 BC- roughly 8,000 years ago. As Zecharia Sitchin and others have pointed out, the Sumerian civilization certainly seemed to spring up quite spontaneously and dramatically. In a very short amount of time, they had written language, education, laws, agriculture and running water, for example. We know that the Sumerians had the Constant of Nineveh, the cycle we discussed earlier. Then, when we factor in Dr. Zecharia Sitchin’s deeper work as well, we realize that a group that had access to incredible technology aided the Sumerians, a group that possessed flying machines, lasers and other exotic equipment. A very advanced understanding of science and physics was present as well, including the knowledge of the full spectrum of planets in the Solar System. We are also told in the ancient Hindu Vedas and the Cayce Readings that Atlanteans did indeed possess flying machines, so this checks out. The maps were kept within the high ranks of the priesthood well after the start of the Sumerian civilization, and eventually, they were secreted into the Library of Alexandria in Egypt, and later into the academic halls of Greece. It is believed that only those who were members of the secret brotherhoods knew of the existence of these maps. The argument for the secret brotherhoods’ existence is extremely strong, and the best book has ever found on this topic is The People of the Secret by Ernest Scott, Octagon Press, London 1983. Scott’s work leaves no doubt whatsoever that this Brotherhood existed, that it secretly allied the major religions of Christianity, Islam and Judaism, and that it still persists in the present moment as a positive group that communes with Higher Intelligence and seeks to gradually unveil the Mysteries to our civilization. So, these secret brotherhoods sent out seafaring explorers to rediscover the lands that were hidden on their maps, to eventually rebuild a great, technological civilization like Atlantis. Francis Bacon, the father of modern Freemasonry, declared the American continent to be the site for the "New Atlantis." And, in order to set this plan into action, the explorers themselves would need to copy over the maps, at least in part, so that they would have something they could work with. Certain authors including Hancock in Fingerprints of the Gods speculate that Columbus had access to these maps, and therefore knew that the Earth was actually round, and that new lands would be found overseas. All of this proved to be quite interesting to Ivan P. Sanderson, the "father of the Grid," and now we will see why. The first explorer that we are aware of who copied over one of these maps is Admiral Piri Reis, in 1513 AD. The man who put all of this map information together is Charles Hapgood, however his theories did not initially start with these maps. Hapgood was a History of Science professor at Keene College in New Hampshire, although his areas of inquiry obviously went far beyond simple history. Hapgood’s basic theory concerns Earth crustal displacement, a close analog to the idea of "pole shift," where the surface of the Earth actually changes position. "may be displaced at times, moving over the soft inner body, much as the skin of an orange, if it were loose, might shift over the inner part of the orange all in one piece." This theory drew the attention of Albert Einstein as well, who contributed the forward to Hapgood’s 1953 book. I frequently receive communications from people who wish to consult me concerning their unpublished ideas [Einstein observed]. It goes without saying that these ideas are very seldom possessed of scientific validity. The very first communication, however, that I received from Mr. Hapgood electrified me. His idea is original, of great simplicity, and - if it continues to prove itself - of great importance to everything that is related to the history of the earth’s surface. And so, Hapgood’s theory explained that at various points in time, the landmass of Antarctica would move out of the coldest regions, by Earth Crustal Displacement. And, he certainly wins "brownie points," since the best scientist who ever lived substantiated his theory. In later chapters we will see that these facts harmonize with the information from Gregg Braden regarding the rise in the Earth’s "heartbeat" and decrease in its magnetic field strength. Braden reveals that these phenomena have always occurred directly before cases of magnetic pole shift in the past, which could well be "Earth Crustal Displacement" in action. We can see that if Hapgood’s theory is correct, the Atlantean inundation was the most recent example of this displacement, as prior to this point, many maps were drawn of Antarctica without ice. Therefore, the shifting Earth’s crust must have positioned Antarctica in a warmer area before the most recent displacement. So, Hapgood’s model is the best conception that we have for why Antarctica would be in a warmer region. Along with Fingerprints of the Gods, the book When the Sky Fell by Rand and Rose Flem-Ath is also an excellent source for further scientific detail on these points. The other maps that also showed Antarctica under the ice included the Oronteus Finaeus map of 1531. In this case, we get a complete view of Antarctica, with the edges largely uncovered by ice. Rivers and mountains are clearly visible. Another very similar map was produced by Gerard Kremer, known to the world as Mercator, the author of the modern Mercator map projection that is now so commonly used. 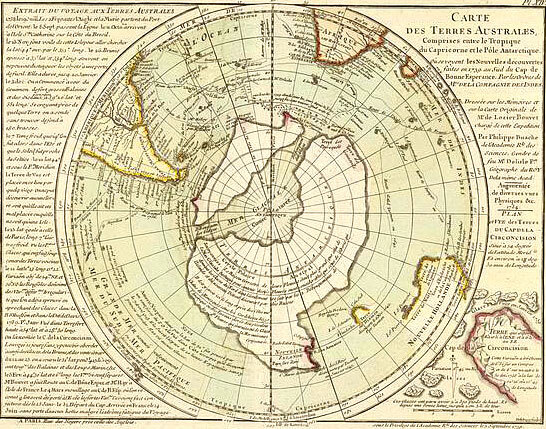 Hapgood concludes that Mercator had access to other source maps besides those used by Oronteus Finaeus, since many recognizable features of Antarctica are more clearly visible in his work. So, it appears that there were definitely several copies available during those times. Another mapmaker who demonstrated equal sourcing and knowledge was Phillippe Buache (below image), a French geographer of the eighteenth century. His 1737 map on right, shows us a version of Antarctica that apparently has no ice on it at all! As we can see, there is a clear waterway that runs straight through the middle, dividing the continent into two main landmasses, one large and one smaller, perhaps a fifth the size of the larger. What makes this even more amazing is that the Buache version of Antarctica is nearly identical to what we actually discovered in 1958, as a part of International Geophysical Year. In this case, a comprehensive seismic survey of the "subglacial topography" of Antarctica was conducted. And indeed, the separation between the landmasses, shown in the Buache map as a waterway, is in almost exactly the same place. Both the smaller and larger landmass in the Buache map are very closely approximated by the findings of the scientists in 1958. So obviously, this is a highly interesting phenomenon, and it goes hand in hand with the work of Carl Munck. Hapgood’s work, which again caught the academic interest of Einstein, provides the foundation for understanding why the Ancients would have known the global coordinates as exactly as they did. We now come back to Ivan P. Sanderson, who also studied Hapgood’s work and was mystified by these incredible pieces of evidence. Sanderson sought to figure out how these ancient mapmakers were able to plan out a full, global map. What type of models would they need to have in order to do something like this, and use it? How did they divide the Earth’s surface up into measurable units? And furthermore, was there anything that was physically observable and measurable in the vastness of Earth’s oceans, so that these mapmakers would actually know where they were in the middle of the sea? Sanderson worked on this puzzle with several associates throughout the 60s and into the 70s. He tackled huge volumes of data, mostly from anomalous reports declared by hundreds of pilots and mariners, and systematically organized them. His results proved beyond a shadow of a doubt that some very interesting anomalies were visible in certain areas of the Earth’s oceans. These anomalies are all very familiar to us, as being those commonly reported in the Bermuda Triangle. This was certainly one vortex that interested Sanderson immensely, although there were other areas that were much more neglected as well. Using statistical analysis to crunch all the data together, concerning all the different places where these events occurred on the globe, Sanderson was able to derive twelve common points of anomalous occurrence on the Earth. Amazingly, these twelve points were all equally, harmonically spaced from each other! The effects of these "vile vortices," as he called them, included not only disappearances but apparently time-warping events as well. Many of these were recorded in books such as Charles Berlitz’s The Bermuda Triangle, but Sanderson found evidence for these time-space disturbances in the other vortices as well, not just by Bermuda. For example, one of Sanderson’s vortices was located near Hawaii. He found a report of a pilot, flying with passengers very near this zone, who suddenly lost all of his instruments as well as radio communications. This is called a "dead zone," or "flying blind," with no ability to radio for help or to determine altitude, position, et cetera, except by "eyeballing" it. The pilot continued to fly for roughly 350 miles in this "dead zone," without being able to connect with anyone on the radio; anywhere from 30 minutes to an hour, depending on his speed. Finally, the bizarre experience came to an end, and he was very relieved to be able to get in touch with the tower yet again. We can imagine the panic and astonishment that must have been in his voice, narrowly avoiding danger and wondering what the heck had just happened. What was so amazing and unexpected was that according to the tower officials, no time had elapsed between his radio contacts! In other words, at one moment he was speaking to them normally, and ten seconds later he was in a panic, telling them that he had flown 350 miles without any instruments! As amazing as it must seem to our "common sense," all passengers aboard this aircraft must have passed into a higher dimensional frequency, where they were not affected by time. The cause of this effect was the hyperdimensional energy that was harnessed by the "vile vortex" they were flying through. By now, the reader should not be surprised when we restate that Sanderson’s twelve symmetrically spaced vortices do indeed graph out one of the Platonic Solids, namely the icosahedron. These three scientists worked directly off of Sanderson’s research, and the twelve points of the icosahedron were placed in almost the exact same location. But, these scientists also added 50 more points, by superimposing a dodecahedron onto the Grid as well. These three scientists worked off of their combined talents to determine this "matrix of cosmic energy" that encircles the Earth. These new lines and points, in conjunction with Sanderson’s, now matched most of the earth’s seismic fracture zones and ocean ridge lines as well as outlined worldwide atmospheric highs and lows, paths of migratory animals, gravitational anomalies, and even the sites of ancient cities. Becker and Hagens’ attention was drawn to this research through the work of Chris Bird, who wrote his article on the "Planetary Grid" in the New Age Journal of May 1975. They were so overwhelmed with this new information that they eventually set up a meeting with him to discuss the work. We propose that the planetary grid map outlined by the Russian team Goncharov, Morozov and Makarov is essentially correct, with its overall organization anchored to the north and south axial poles and the Great Pyramid at Gizeh. The Russian map, however, lacks completeness, in our opinion, which can be accomplished by the overlaying of a complex, icosahedrally-derived, spherical polyhedron developed by R. Buckminster Fuller. In his book Synergetics 2, he called it the "Composite of Primary and Secondary Icosahedron Great Circle Sets." We have shortened that to Unified Vector Geometry (UVG) 120 sphere… We use the number 120 due to its easy comprehension as a spherical polyhedron with 120 identical triangles - all approximately 30, 60 and 90 in composition. And now, the moment we’ve all been waiting for: the Becker/Hagens grid, which finally "cracked the code" of the Platonic Solids’ positions on Earth. Right away, you should be able to see the amazing correspondences of this Grid to the physical forms of the continents, among other things. The Planetary Grid System shown [here] was inspired by an original article by Christopher Bird, "Planetary Grid," published in New Age Journal #5, May 1975, pp. 36-41. The hexakis icosahedron grid, coordinate calculations, and point classification system are the original research of Bethe Hagens and William S. Becker. These materials are distributed with permission of the authors by Conservative Technology Intl. in cooperation with Governors State University, Division of Intercultural Studies, University Park, Illinois 60466 312/534-5000 x2455. This map may be reproduced if they are distributed without charge and if acknowledgement is given to Governors State University (address included) and Mr. Bird. It becomes immediately obvious that this Grid indeed controls the positioning of continental landmass on the Earth. So, it should be visible to "those with eyes to see" that the Global Grid is very obviously shaping these land structures. If you look at South America, for example, you can see the extremely obvious effect of this particular "grid triangle," in literally forming the continent around itself. In looking at the southernmost tip of South America, you can see how the force of node number 58 pushes the land away from its due south trend and towards the east. Then, if you look at node 49, on the middle of the East Coast of South America near Rio de Janeiro, you can clearly see how the force of the node has pushed the landmass of the continent into a rounded shape. Then, looking at Australia, you can clearly see that the whole continent, and especially the northwest side, forms very precisely within the stretching forces of this area of the Global Grid. Here, if we look to the exact north and middle of Australia on point 27, we see a circular "node point" displacing the land around it and forming the Gulf of Carpenteria. Again, the nodes themselves have shaped the land into circular "vortices," repelling the continental mass from themselves and in this case, also shaping the outline of the island directly above Australia. These circular forms, as we shall continue to see, are consistently visible in conjunction with the Global Grid. We saw them in Egypt on our chapter regarding Carl Munck, forming the Nile River coastline on the Mediterranean. Also, node 44 is precisely aligned with the bottom of Antarctica, and we see either edge "drooping" to the right or the left from this. According to Richard Lefors Clark, this is the "bowtie" energetic configuration showing itself in the Australian landmass, which he calls a "diamagnetic energy vortex." We will examine how such a shape could be formed by the curved, spiraling energies that make up the grid below. Clark also shows us that the Gulf of Mexico follows this same curving energetic organization, as well as the two coastlines of the continental United States. The downward-pointing triangle certainly describes Africa well, and the extra land on the western side can be explained by the pressure coming from the Mid-Atlantic Ridge, which is almost precisely the same as the Atlantic grid line formed by points 10, 19, 37, 38, 39 and 50. The east coast of Africa and Saudi Arabia follow the eastern side of the triangle very nicely, on the grid line from point 41 to point 12. We can also see how node point 22 gently pushes in on Africa’s east coast, causing it to dip inwards as it travels and forming the Somalia Basin. We can also assume that the "cracks" separating Africa and Saudi Arabia were caused by the expansion of the Grid, forcefully pulling the land into alignment. The "crack" to the immediate left of point 12 follows the grid line exactly. And finally, the upward-pointing triangle can be clearly seen to cut its way right into the land, with Africa’s coast defining its left side and India’s coast defining its right. In this next illustration above, we can see how point 21, in the center of the African continent, works with its above-right partner point 20 in providing a framework for the bow-shaped energy vortex that shaped the northeast coast of Africa. Again, we see Dr. Lefors Clark’s bow-shaped "diamagnetic energy vortex" shaping the land in a smooth curve. We can also see the same curving formation created by the east coast of India and the west coast of the China / Korea / Vietnam area of Asia. This vortex is balanced between points 24 and 13. We remind ourselves that these smooth curves illustrate the spiraling nature of the superstrings that make up these geometric energy fields, here expressed as spiraling lines of magnetic force. Let us remind ourselves that Clark’s primary example of this bowtie energy is that which occurs in the general area of the Bermuda Triangle, with its opposite pole forming the eastern coast of Mexico. According to Dr. Clark, the point at the center of the "bowtie" becomes a magnetic null zone of zero gravity when appropriately triggered by the right geometric positions of the Sun, Moon and Planets to the Earth. In those moments of conjunction, there is a "hyperdimensional bleed-through," and we then get time dilations, disappearances, gravity loss, levitation and other related phenomena. In the next three pictures on the next page, the circular grid energy formations surrounding the east coast of China and surrounding area are easily seen. So, we can see that when you know what you are looking for, and you have the Grid map, these formations cannot be hidden. In picture number 1, we have our straight grid map of China for comparison. Picture 2 has three circular vortexes in it. We have already discussed the bottom left vortex in India and China. Then, the center vortex shapes the East Coast of China, based off of and emanating from point 13. The uppermost and largest vortex in Picture 2 shapes the entire Japanese and Russian archipelago, and is centered in and emanating from point 4. Finally, in picture number 3 we have a vortex centered in Sanderson’s "vile vortex" near Japan, the "Devil’s Sea," here listed as point 14. This vortex is "equalized" by points 25 and 26, both of which are equidistant from the edge of the circle. And obviously, the Philippines precisely traces the bottom left of the circle itself. Another area of continuing disappearances and mysterious time-warps is the Devil’s Sea located east of Japan between Iwo Jima and Marcus Island. Here events have become so sinister that the Japanese government has officially designated the area a danger zone. This area was significant enough to the work of Bermuda Triangle author Charles Berlitz that he wrote a whole book dedicated to it and the "bigger picture," entitled The Devil’s Triangle. It is becoming more and more clear that our geometric shapes, expressed as the consciousness unit expanded to a planetary scale, are far more than abstract concepts of theoretical physics. What we have here are direct, quantifiable and measurable phenomena, and these geometry-based Grid patterns are simply the simplest, and therefore the best solution to the problem. If the reader wishes to see more of the connections between the Becker/Hagens grid and the landmasses, simply stare at the map for a while and they start popping out. The reader will remember that in previous chapters, we showed the "grid bands" on the Earth and how their effects shaped the Ring of Fire, the flowing of the Nile River, the "node point" of the Egyptian northern coast centered in Giza, and the vertical structure of the Yucatan Peninsula. Now, with the full map of the Becker / Hagens grid, we can see a great deal more from the effect of these straight longitudinal lines. As one example, by referring back to the main map, the reader can clearly see that the entire Eastern side of Hudson Bay in Canada precisely follows the line from 18 in Florida to 9 in the Bay to 61 at the North Pole. Furthermore, all of England is precisely within the line created by point 20 in Africa, through point 11 in England to point 61 at the North Pole. So, there are a variety of ways to see this energy at work on Earth. One can begin to visualize this Grid energy as a living net of "wires" that are tightly stretched over a thin balloon. It is obvious to us that what we think of as randomly placed continents are actually conforming to this massive energy. As we look at the different diagrams of how these geometric energies show up on Earth, we do indeed get a sense of the massive forces that are involved with this Grid. We know that gravity is not the full extent of these forces, either, as they can be shown to have profound effects on human consciousness. Becker / Hagens explain how these Grid points also seem to attract large population centers. We have shown that a pyramid is actually a physical, crystalline structure that is built to be identical to our own native dimensional frequency of the octahedron, for the purposes of harnessing energy. The Wilcock reading in chapter 17 told us that the circle shape of stoneworks like Stonehenge and earthworks like the Mound Builders’ creations in Florida also work to harmonize with this upward-spiraling Earth energy. Again getting back to our discussion of Dr. Clark’s information, we can look back to the South American landmass. Not only does it fit perfectly within our "Grid Triangle," but we can see yet another example of this circular, "bowtie-shaped" energy at work in the actual shaping of the landmass itself. This "bowtie" is nearly centered within the diamond that is formed between points 18, 35, 37 and 49. We already saw the African "vile vortex" shaping a similarly large "bowtie" in the above diagrams. The offset of the South American landmass from being precisely within this "diamond" again could be accounted for by the pushing of the Mid-Atlantic Ridge, which follows the lines of the Global Grid with amazing precision. Looking back to the Becker / Hagens map, it is quite easy for us to see how this line clearly demarcates the separation between the continents, just as the Mid-Atlantic Ridge is the point of expansion between the two continental plates. We have just examined the circular energy formations caused by the Grid in the Asian area of the Pacific Ocean. And here, we can see what happens when we draw an even greater "great circle," based strictly on the island formations in the Philippines area of the Asian Pacific. Here we can see that an elliptical-shaped gravity field is clearly visible when the center is placed directly in node 15. If we use any standard image editing program and "drag out" an ellipse using point 15 as a center, we can indeed align it precisely with the island formations to the far west of our diagram. We can try other center points besides 15, but the ellipse will not fit anywhere else as precisely as it does right at that spot. Right away, we should see that this very large energy vortex seems to provide the clearest Grid counterpart for the existence of the Ring of Fire, which is a ring of volcanoes and tectonic activity surrounding the Pacific Ocean. When we look at this "grid ring" carefully, we can see that it represents the perfect fusion between the Earth’s landmasses and the Global Grid. We can also see that this ellipse is well defined by points 14 and 16, again Sanderson’s powerful "vile vortices," the points of the icosahedron. We have already seen how the gravitational force of these "vortices" was able to shape the entire upper Western half of Africa into an elegant, circular shape. Now, we are seeing two of these vortices working together to form an even larger shape. The ring forms part of the East Coast of China, as well as a good part of the upper Russian coastline surrounding node 5. It also defines part of the southern coastline of Alaska. Perhaps most interesting of all is that the combination of forces that are demonstrating themselves in this map look very familiar to a microscopic formation in nature. Take another look and you will see it… Cell Mitosis! We can certainly see that Mother Earth is giving all Her secrets away, right in front of our very eyes, if only we understand Her Grid. The grid points 14 and 16 would be akin to the two poles of the dividing cell. The gridlines provide us with a simplified depiction of the "spindle fibers" that form in cell mitosis. The actual ring of energy that is created forms a precise analog of the nuclear membrane of the cell, as it continues its expanding, elliptical process of division. If this is interesting, it becomes even more interesting when we look at page 31 of Robert Lawlor’s book Sacred Geometry. There, he has printed a diagram showing the eight stages of cell mitosis. In other words, we can see a very direct analog of the "consciousness unit" yet again in the cell; a process of division with eight stages in seven intervals. The human nervous system, as Lawlor explains in his book, also shows us this octave structure. Now, we can see the Grid counterpart to this, which occurs through hyperdimensional geometry that is octave-based. So, you might be wondering, what does this mean? Why does it matter if there is an octave pattern in cell mitosis or the human nervous system? We can look back upon previous chapters and see all the clues. Sources such as the Cayce Readings and the Ra Material tell us that we live in an octave-based, eight-dimensional universe. We then observed the world of cutting-edge, modern "superstring theory" physics and discovered that with one slight adjustment, they have discovered the same thing. Srinivasa Ramanujan’s divinely inspired ’modular functions’ are all octave-based. We have cited numerous spiritual works that tell us that the One originated as Pure White Light, and fragmented down into the octave or spectrum of frequencies or dimensions. Each discrete interval represented a different aspect of this Wholeness. We know from basic intuition, as well as sources like the Ra Material, that Nature will provide us with physical metaphors to explain the metaphysical. Look at the structure of the seashell and its depiction of the phi spiral, for example. In Lawlor’s book Sacred Geometry, we can also see numerous examples of the Renaissance scientists making clear connections between these harmonic ratios and the proportions of the human body. As we continue to explore these issues, we can indeed see what transcendental significance the human body actually has, built directly into its design. "Man is the measure of all things." We can now see that the cell division is another natural example of these sacred, octave-based mathematical principles showing up in the physical universe. The original cell would represent the sphere, or the first note of the octave. There are then seven stages, or frequencies, that cause cell division to form. Then, at the final stage, the eighth, we now have two cells, and the division is complete- the original form has again emerged, only now having produced a precise copy of itself. This also is akin to the octave structure in the atom, where each electron that is released puts the atom through different isotopic stages. Once you break the "octave" threshold, the atom metamorphoses into the next element in the Periodic Table. In other words, this process of energetic expansion, emerging from the central core, or nucleus, or Sun, produces an evolution in the actual form of its entire structure. This is the way that all consciousness units operate, whether it is sub-microscopic, atomic, cellular, planetary or even Solar System-wide. We know that the system of geometry for the CU is also harmonic and octave-based, and thus we see these Platonic forms emerging in minerals, in the organization of cells in a developing zygote, and in the planetary grids themselves. We also know that these frequencies are governed by very simple, harmonic numbers. These numbers show up when we measure the vibrations of sound frequencies in air. Therefore, when we see these same frequency numbers for the CU emerging in the Great Sunspot Cycle in later chapters, we can see that a similar division and enhancement is occurring in our Solar System as a part of this fundamental, interweaving system of energetics. This is yet again another reason to see why we are so quickly heading into a spontaneous dimensional shift here on Earth, or the Single Greatest Moment of All Time.